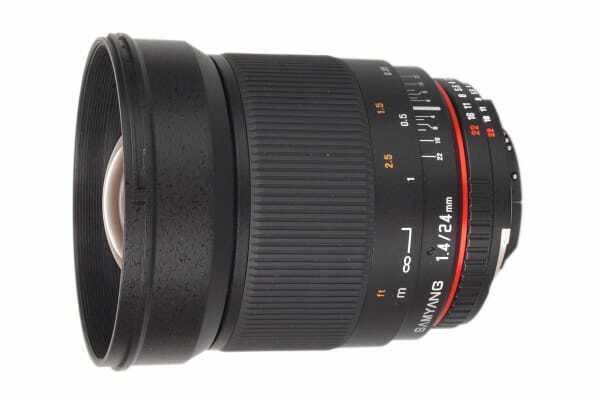 The Samyang 24mm f/1.4 ED AS UMC Wide-Angle Lens for Nikon offers a wide 84 degree view when used with a full-frame 35mm camera, 57.6 degrees when used with an AP-C camera or 47.6 degrees with Four-Thirds cameras. This Nikon version comes equipped with a sophisticated microprocessor, allowing you to control exposure parameters from your camera and take full advantage of the benefits provided by its i-TTL flash system. Extreme versatility – take it anywhere! The lens boasts extreme versatility, being well-suited to landscape, interior and street photography, as well as low-light and general photography. The lens can focus as close as 9.84” from the apparatus itself, enabling outstanding wide-angle close-up views. There’s simply no shot too difficult when you take advantage of this highly versatile wide-angle lens! Enjoy outstanding, sharply defined images with minimum aberrations thanks to the lens’ intricate construction of four low-dispersion glass elements, along with two aspheric elements. Fitted with a multi-layered, anti-reflective UMC coating, the lens also provides superb light transmission, while reducing flare and ghosting.